This great blues/soul band, live and on the road: singing, horns, killer guitar, real music. You want some powerful real music, the kind of music that shamelessly moves at you with emotion and soul? Is this just the tonic for you, what the doctor ordered, the sort of juice that might put hair on your chest or perhaps a skip in your step? Well, let me recommend something in a husky yet pliant singing voice, good with a ballad like “Midnight in Harlem” but also game and glorious on an Elmore James blues like “Rollin’ and Tumblin’”. Let me suggest that such a voice—owned and used with authority by the lovely Susan Tedeschi—is just the ticket to getting your temperature rising. It growls and shouts as necessary but is equally capable of a caress. And this quality, of being multifaceted in a world that prefers pigeonholed pop stars who sing the same song over and over again, it’s too rare lately. It’s great. I might also suggest that you try on something in a stunning electric guitar player. Not just a guitar that is fast or loud or flashy, though Mr. Derek Trucks is all those things when he chooses to be. But rather, I suggest you look into the kind of guitar that speaks—that sings—like an actual human voice. A slide guitar that moans and bends tones and a blues guitar that lives between diatonic notes and a jazz guitar even that moves in surprising harmonic twists when surprise or coloration makes sense. Is that a big mess of description? Then just tune in to “Nobody’s Free”, a ten-minute stretch of live music that lets a guitar do just about anything that a guitar could want to do. It could want to start with a screaming set of jacked-up chords that rip and roar, then move into gentle finger-picking that accompanies the soothing-to-gutbucket vocal. And it could play a greasy figure behind the horns in ripping unison. And it could then let the rhythm section get out of the way, be very very quiet, and begin a sculpture of a solo that starts from a few squiggled notes, moves into dramatic blues figures mirrored in near duet by electric bass, and then trades a daring figures with the drummer before ending in a set of jazz-drenched twists and turns. And what if I then told you that the guitar playing underneath the subsequent flute solo was, if anything, even more subtle and astonishing: the kind of hip and detailed rhythm playing that is so good that it almost constitutes a “solo” unto itself—a jittery, complex, riveting set of scratches and chops and thrums that frames the horn perfectly? Yup, that Derek Trucks can play. But if you want absolutely great music, then you’re going to want, going to need more. You might want an any-style-you-like rhythm section—versatile but committed, detailed but never fussy. Two drummers that don’t sound like a pointless affectation but a rhythm team: amazing. And a bass player like Oteil Burbridge who knows when to lock down a minimal-note groove and when to range all over his guitar like a puppy hunting for a tennis ball. (Do you dig is solo on Stevie Wonder’s classic “Uptight”, where he scats along with bass, George Benson-style? I think you do.) And his brother Kofi on organ who can whistle something sweet and then, literally, pull out all the stops to scream from the Leslie mountaintop. I would also want to get you into something in a horn section. Because the American tradition of jazz and blues and R&B, of jump music and Western Swing and you name what-all else—it likes full-throated saxophones and tart trumpets and beefy trombones. And these horns can sound as big as Basie on some tunes, such as “Learn How to Love”, where they play figures that ride beneath the singing but then rise up to the surface too, that punch, that jab, that play hide-and-seek with the guitar. And that then get out of the way for one of their own (Mr. Kebbi Williams on tenor sax) to blow a wild solo that bends tonality and flirts just a touch with the avant-garde before ending with a show-stopper bit that satisfies everyone. Horns, baby: real soul stuff. And I would be horribly remiss if I did not also try to sell you a troup of other voices—the deep harmony you can’t do without—in the form of Mike Mattison and Mark Rivers. Because as wondrous as Susan Tedeschi is, these cats bring some deep and glowing resonance when they open up. The simple, low echo in “Harlem” (written by Mattison—really the best pop song of the last year or two) or the solo parts and massed harmonies they bring to the Staple Singers’ spiritual “Wade in the Water” or if you tune into “Love Has Something Else to Say” and you hear them underpinning and answering Susan—then busting out in soulful solo parts that make you realize that these guys are fully capable frontmen, they are, yup. But what I’m really selling here aren’t the parts of something separately but a whole: a whole band, an actual working band that was on the road, playing these live shows in theaters to music fans who wanted to hear the parts lock together into something bigger. Which is what was happening on this tour in support of the Tedeschi Trucks Band’s first record, Revelator, Grammy winner for Best Blues Album, except it wasn’t really a blues album at all but a great pop-soul record that lit up 2011 the way great records used to light up whole years. Not that you hear this stuff on the radio anymore, really, what with it being kind of “old” music in an older tradition, its roots in Sly and the Family Stone maybe or even in the Carter family or in any of those touring R&B ensembles from the mid-1950s onward that barnstormed from town to town getting asses (and emotions) moving. 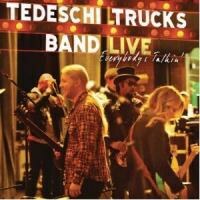 Tedeschi Trucks is that kind of band for today. Maybe, really, just what you need.